A friend of mine from long ago taught me the concept of the Five Star Day. It’s a day in which multiple good things happen. There are different degrees of Five Star Days, from the epic to the quietly sublime. Winning the lottery, booking that trip to Paris and then celebrating with friends at a fabulous restaurant would be an epic Five Star Day. A day spent skydiving, mountain climbing, deep-sea fishing and then eating the best meal of your life, all in an exotic foreign location, would be epic. Having quintuplets would constitute an epic day, at least until the reality set it. Yesterday I had a Five Star Day of the quietly sublime variety. For starters, all of my three grown children were under the same roof for a while. One son was home from college for the weekend, my high school senior graced us with his presence for a few hours, with the bonus of his lovely girlfriend visiting, and my daughter dropped by for a visit. I made pancakes for breakfast. My daughter helped me cook lunch, a delicious pasta dish. That was nice. 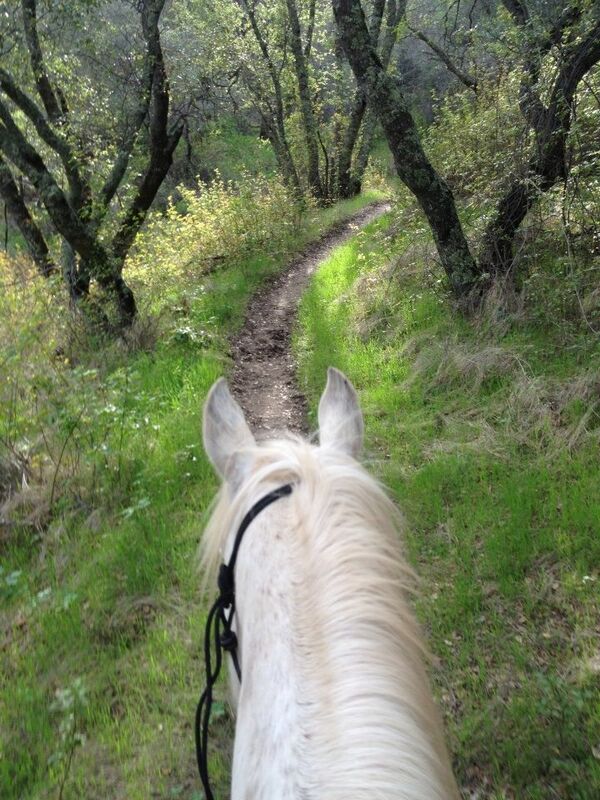 Then we headed out for a horseback ride on a gloriously bright spring afternoon. 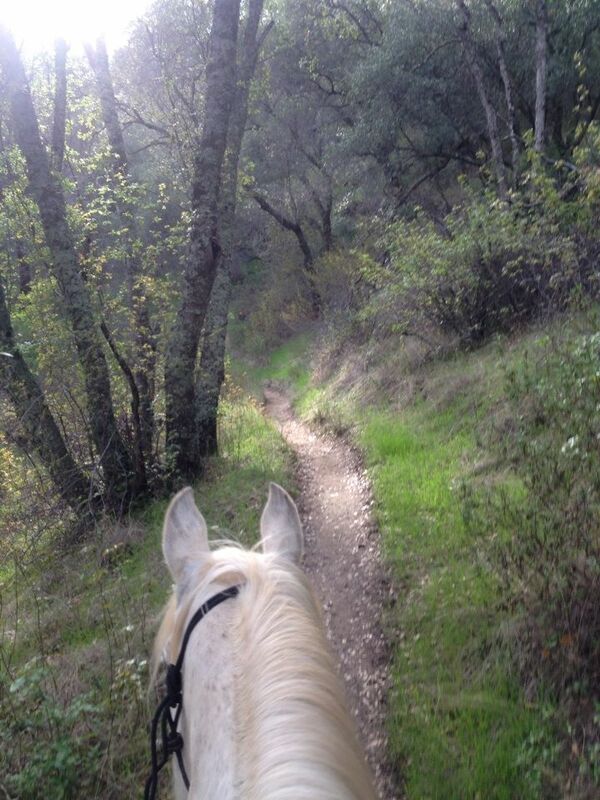 My horse, Rushcreek Newly, was beautiful and feisty and eager to get down the trail. He was sure-footed and steady, giving me one exuberant crow hop cantering across an open field, but gently enough that I stayed securely in the saddle. This is Newly, deciding where he’ll spring his little buck on me. The world was almost impossibly green, our drought-starved area having just gulped down several days’ worth of rain. 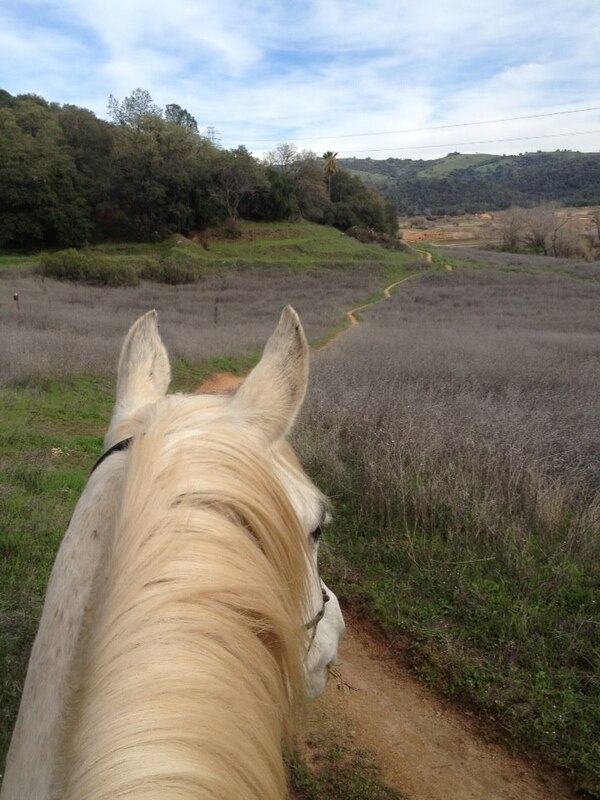 But the trails were dry and the footing good. 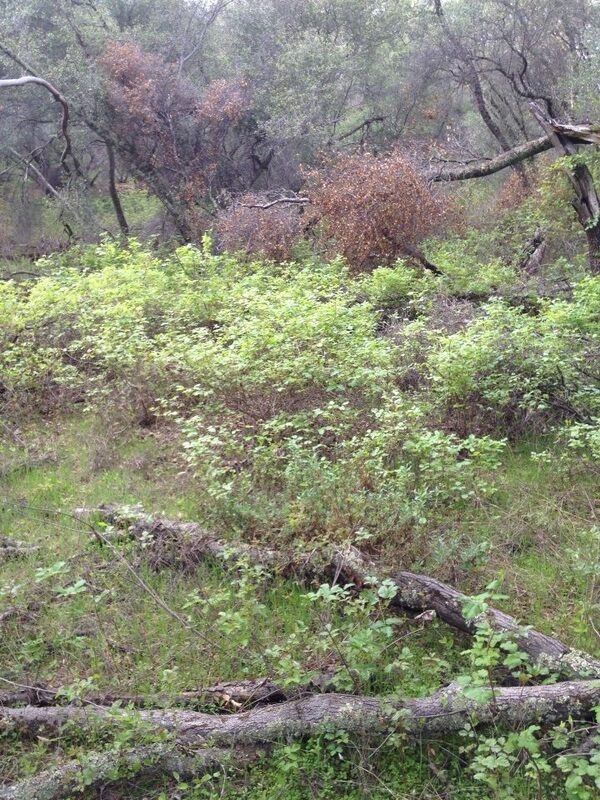 Even the poison oak was beautiful. There is going to be a lot of it this year. I had Lagavulin in my flask, and every once in a while we stopped cantering and trotting and let the horses munch on sweet grass while we partook of a smokey drop or two. We raced the setting sun back to the horse trailer. Back at the trailhead we chatted with old friends and made a new one or two. There were lots of horsemen and woman out, and everyone was happy. Just as we were hauling the trailer up the driveway back home, my stomach rumbling and the words “I could really go for some pumpkin curry right about now” on my lips, a text popped up on my cell phone from my friend Tracey. She and her husband Kent were heading to the nearby town of Auburn for dinner. Would we care to join them. Would we ever. It took us two minutes to unload the horses and pull sweaters over our dusty riding clothes, and off we went. I didn’t even change my boots. We met at the Royal Thai restaurant in Auburn, one of my favorite places. I experienced a small twinge of guilt for overtaking the dinner plans to land us there. But their pumpkin curry haunts me. I sometimes sneak a bowl when I am allegedly out grocery shopping or doing other worthwhile things. So I got to have pumpkin curry, my own bowl and half of Tracey’s. I’m pretty sure she offered it to me. I hope so. Then we went back to Kent and Tracey’s, and Kent made us Vespers, a drink for which he should rightly be famous. 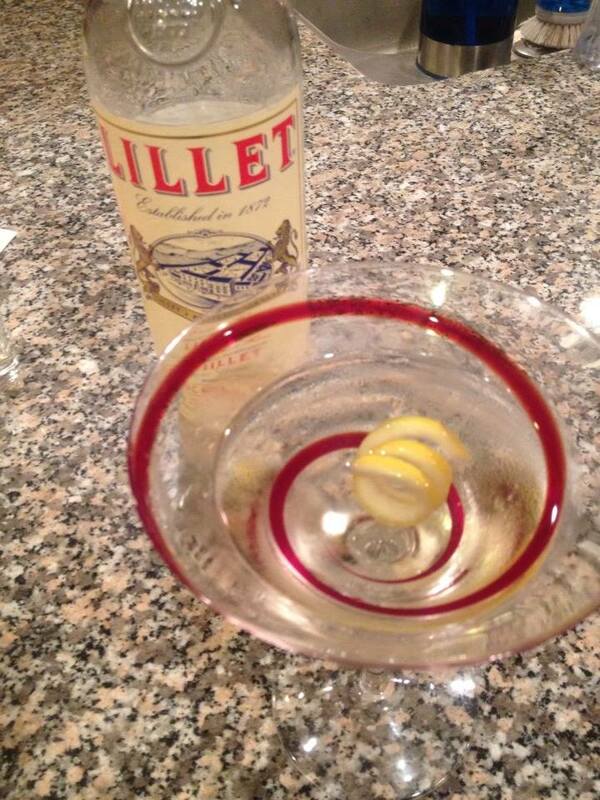 Russian vodka, English gin, ice-cold Lillet, and the most perfect lemon twist. Then we made plans to meet for breakfast and a hike the next morning, and the day, so well begun, ended on a hopeful, happy note. One last picture from our ride. We passed this stretch of old cattle fencing on the trail. 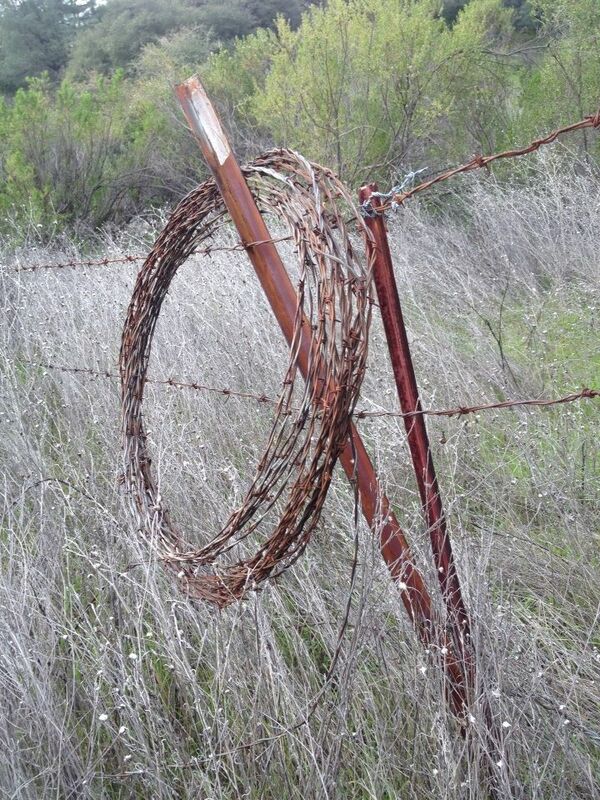 Even barbed wire is beautiful on a Five Star Day. I know we all have a certain number of epic Five Stars allotted to us in a lifetime. The number may depend a bit on how vigorously we chase them. I think the potential for quietly sublime Five Stars, however, is endless. I am always grateful when one sneaks up on me. I love this. Quietly sublime Five Stars happen for me on days that I never even leave my property sometimes, just moving from one quadrant of it to the other, focusing attention on house, dogs, horses, the sky, a book, or nothing at all. I agree on both counts, my dear friend, a thousand-fold. I love comparing Rushcreek notes with you.